As of 26 August 1939, NCOs and men with special linguistic or technical skills, but lacking in necessary military training, were permitted to be promoted to NCO or officer supervisory status as Specialist Officers. They wore standard military uniforms (excepting as detailed below), and did have officer's rank (without an actual commission) and authority (but only within the area covered by their occupation) excepting those graded equivalent to NCOs. The rank titles and insignia of the Sonderführer changed in March 1940; in a desire to encourage these men to undertake military training and become full-fledged military officers, insignia closer in design to standard Army insignia was introduced. The rank titles remained the same. In Dec 1942, new rank titles were introduced, and the insignia reverted back to the pre-1940 styles. In general, the main difference between Army uniforms and those worn by a Sonderführer was the use of grey-blue cloth in place of the dark green badge cloth. In all cases, whether due to availability or personal preference, standard Army garments and insignia were sometimes worn in place of the grey-blue. Headdress - The standard pattern of Schirmmütze was worn, but a grey-blue cap band was intended to be worn rather than the dark green. The soutache on the Feldmütze was also blue grey. In December 1942, aluminium chinstraps with a blue-grey thread woven into it were introduced for wear by Specialist Officers. Field Blouse - The dark green collar of the field blouse was in theory substituted by a collar of blue-grey. As well, breast eagles were to be on a blue-grey backing rather than dark green. Collar tress was introduced for NCO-equivalent specialists in May 1940. Collar Patches and Shoulder Straps - the main difference between Army uniforms and those worn by a Sonderführer was the rank insignia. The collar patch for all ranks was done in matt aluminium, on a grey-blue backing. Early pattern shoulder straps were in bright or matt aluminium, plaited, for field grade officers (i.e. 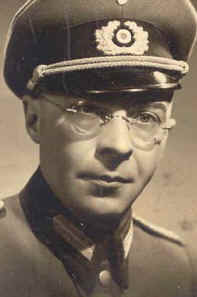 Major equivalent or above), Hauptleute and Leutnante equivalent officers wore flat thin thread shoulder boards, and NCO equivalent had dark green flat thread shoulder boards. Slides on these early shoulder boards were gold artificial silk for officers, and bright aluminium for NCOs. Medical personnel wore a gold coloured staff and snake, while veterinary personnel wore a gold coloured snake. In March 1940, Army style shoulder boards were introduced, with red/white/black stripes added to the standard shoulder strap material, with the waffenfarbe being blue-grey. Rank stars were in aluminium, as were the staff and snake devices worn by medical personnel and the snake device worn by veterinary personnel. In 1942, when the earlier shoulder boards were readopted, gold coloured shoulder board devices were also readopted. Above - The early/late style of shoulder strap, as worn by an Air Force Sonderführer. Right - collar patches as worn by an Army Sonderführer.